I’d guess that for a lot of the people who watched last night’s Will Ferrell-hosted season finale of Saturday Night Live, the highlight might have been the last sketch, which featured Ferrell singing Billy Joel’s “Goodnight Saigon” along with the entire SNL cast, Tom Hanks, Amy Poehler, Maya Rudolph, Green Day, Norm Macdonald, Paul Rudd, Anne Hathaway, Elizabeth Moss, and, for some reason, Artie Lange. Others might have liked the “Celebrity Jeopardy!” reunion or the return of the Mayrelle Sisters. For me, however, the best part was the funeral sketch — which itself was a retread of a wedding toast sketch from the Hugh Laurie episode earlier this season. 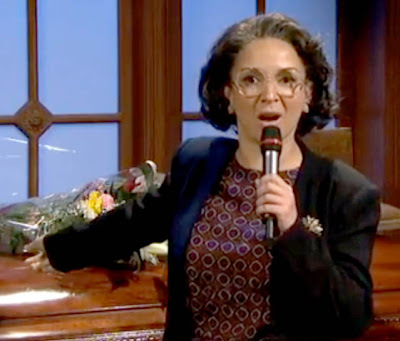 The big difference between the original and this one is the out-of-nowhere appearance of Glenda Goodwin — a rather obscure Maya Rudolph character whose handful of appearances have, to my knowledge, never been reproduced in online videos and only one of which appears at SNL Transcripts. And then in the second verse, she asks for directions to nachos. I have no idea why Glenda Goodwin was given a chance to return, but I’m guessing it’s just a coincidence that the character’s first appearance referenced Land of the Lost, the remake of which Will Ferrell was plugging in his hosting gig. The first Glenda Goodwin sketch was a commercial for her legal services, in which she promised to defend clients in cases involving paranormal circumstances such as invisible robots, werewolves, Tyrannosaurus rexes, paintings with moving eyeballs, and the Sleestaks from the original Land of the Lost. Glenda Goodwin wonderment aside, the wedding toast sketch was better, mostly because Kristen Wiig’s delivery of its final line — “There’s a body in bathroom!” — is unbeatable. I need to youtube this NOW! Also when are you buying me a drink? I def know the diff b/w THE GLORIOUS SCISSOR SISTERS and the sisters switchblade. I like caipiranha's and mojitos. mmm sugar! Artie Lange was there because he was hanging out backstage with friend Norm, and casting director Marci Klein basically grabbed his hand and forced him onstage. And then did the same for the goodbyes. The things I know from listening to the Howard Stern Show. And to Le Meems, Rudolph has been bearing Paul Thomas Anderson's children, and now has the upcoming Sam Mendes movie Away We Go.